The second week of preseason is completed and while I lost, it was in some sense a morale victory (though that will make Coach cringe). See the score below. Note how the football score calibrates the success of each day. The week started out great, then it just frankly turned into a lot of fun. Yes, I went over my goals for 5 days, but these days were not as bad as I thought… And, finishing up with a score on Sunday was a good thing. Sunday (Dynasty Day) - Return to normalcy, except the Steelers lose to Denver. In any case, I skipped all the beer, did some much needed yard work, and watched most of the Steelers game at Club Julian. Man the gym is lonely during a Steelers game. Heck it was just me and Ben Roethlisberger, it seemed. Saturday (Laughingstock) - Turned out what started to be a juice day, ended up a Sam Adam’s seasonal brew day, more guests in the afternoon, and then some blues and BBQ at night with the wife. Super fun, but chalk up another day of falling short of the DGO. Friday (Laughingstock) - Oh, boy. Well, have to join the bro and pop for beers at the Highland. Bud joined. Good time all around. Talked to some old friends. Oh, wait, I picked up some McDonald’s on the way back. I shared it with Coco so it wasn’t the all out binge it could have been. Frankly, my stomach just aint up for it. Thursday (Laughingstock) - It’s turkey day. Happy Thanksgiving all. Of course, I am most thankful for the wonderful people in my life, but in terms of health, I am thankful for having a chance to get healthy again. Think about that. I am overweight, but it all still works. Can I really complain? I should be thankful and so should you. Lots of good football today, 3 games to take with all that good turkey. What is my health approach today? I am not limiting myself, just measuring what I did afterword. On that note, bless all you there. Happy Thanksgiving folks. Wednesday (Laughingstock) - Man, I hate to say it but the last day of work was rough. I ran to the can about twenty times and between work related tasks, was seriously wondering if a I got strain of E Coli. Yikes. Stopped at Walgreen’s and pharma told me to load up on Bepto. I did. Despite the upset stomach, met The Prophet and Bud at the Highland for a few Pre-Thanksgiving beers. Tuesday (Wild Card) - Okay, so seriously, I ate a grilled chicken sandwich late Monday evening after working out to kind of make Tuesday a non-ravenous all-you-can day. So that sandwich had all the vegetables you could think of, including romaine lettuce. Next day I am literally running to the crapper every 10 minutes. In the morning, I see an article on CNN that the CDC is recommending we throw all romaine lettuce out. Oh, boy. I hope it ain’t E Coli for crying out loud. Later in the day, it was the Highland Bar in West View to meet a few friends from some beers. In the house were Prophet and Bud. Naturally we made prognostications for the upcoming Steelers Denver football game, which I will be posting about at some point this week. Monday (Dynasty Day) - Killed it at Club Julian. Watched Aaron Donald dominate on Monday Night Football against the Kansas City Chiefs. I wonder if the Super Bowl match up we want see is the Steelers Offensive Line against the Chiefs Defensive line? Could you give a Super Bowl MVP to a lineman. Of course. To address the problem of fasting and then going way overboard on the non-fasting window, I am trying to eat to within the 600 calorie fasting limit and deducting calories for exercise. What went down the pie hole? Half a grilled chicken sub, potato salad and some pistachios. About 1200 calories on the day. And, there was the juice in the morning. Minus the 1000 or so calories on the treadmill and I may have had the best workout of 2018. That’s great. However, it is November. It’s not garbage time, but it is! Check throughout the week for some mundane highlights… You must be really sad to find this something worth spending time on. No worries. I am in the same boat. Scratch was cooked like a turkey this week. 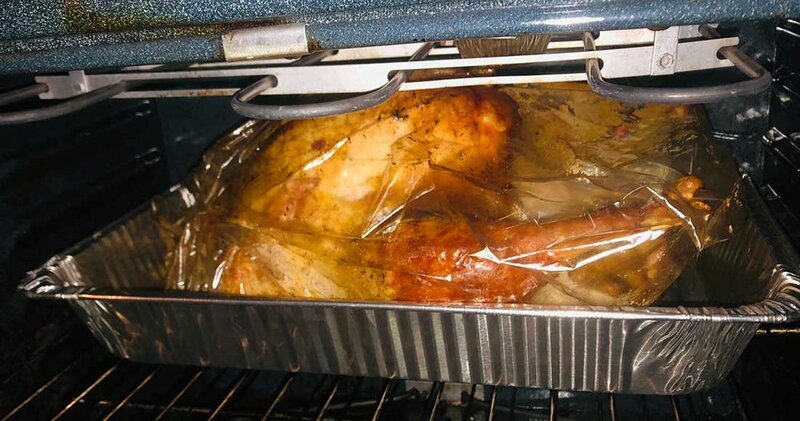 And, speaking of which, this was the Thanksgiving turkey that ironically helped cook him. Damn, it was good. Country road clip at the Wheel Fish bar. A peek into the real week. Get an overview of Season 47, including some dreaded “before” photos.